Based on the author's extensive fieldwork, this classic ethnography, now in its fifth edition, focuses on the Yanomamo. These truly remarkable South American people are one of the few primitive sovereign tribal societies left on earth. The new edition includes events and changes that have occurred since 1992, including a recent trip by the author to the Brazilian Yanomamo in 1995. Chagnon is best known for his long-term ethnographic field work among the Yanomamö, his contributions to evolutionary theory in cultural anthropology, and to the study of warfare. The Yanomamo are a society of indigenous tribal Amazonians that live in the border area between Venezuela and Brazil. Working primarily in the headwaters of the upper Siapa and upper Mavaca Rivers, Chagnon conducted fieldwork among these people from the mid-1960s until the latter half of 1990s. Because the Yanomamö people could not pronounce his last name, they nicknamed him "Shaki", the closest pronunciation they could approximate, which also seemed appropriate because Chagnon was constantly asking questions, and "Shaki" means "pesky bee". A major focus of his research was the collection of genealogies of the residents of the villages that he visited, and from these he would analyze patterns of relatedness, marriage patterns, cooperation, and settlement pattern histories. Applying this genealogical approach as a basis for investigation, he is one of the early pioneers of the fields of sociobiology and human behavioral ecology. 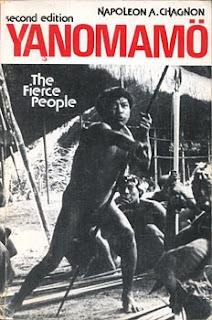 Napoleon Chagnon is well known for his ethnography, Yanomamö: The Fierce People (Holt, Rinehart & Winston, 1968) which was published in more than five editions and is commonly used as a text in university level introductory anthropology classes, making it the all-time bestselling anthropological text. Chagnon was also a pioneer in the field of visual anthropology. He collaborated with ethnographic filmmaker Tim Asch and produced a series of more than twenty ethnographic films documenting Yanomamö life. His life's work has made him both a celebrated figure and a lightning rod for controversy and criticism.